By default, the Block Storage service uses an LVM back end as a repository for volumes. While this back end is suitable for test environments, we advise that you deploy a more robust back end for an Enterprise environment. When deploying Red Hat OpenStack Platform for the environment, we recommand using the director. Doing so helps ensure the proper configuration of each service, including the Block Storage service (and, by extension, its back end). The director also has several integrated back end configurations. Red Hat OpenStack Platform supports Red Hat Ceph and NFS as Block Storage back ends. For instructions on how to deploy Ceph with OpenStack, see Red Hat Ceph Storage for the Overcloud. For instructions on how to set up NFS storage in the overcloud, see Configuring NFS Storage (from the Advanced Overcloud Customization guide). Fujitsu Eternus is also supported as a back end, but is not yet integrated into the Director. Settings are associated with volume types using key-value pairs called Extra Specs. When you specify a volume type during volume creation, the Block Storage scheduler applies these key/value pairs as settings. You can associate multiple key/value pairs to the same volume type. Volume types provide the capability to provide different users with storage tiers. By associating specific performance, resilience, and other settings as key/value pairs to a volume type, you can map tier-specific settings to different volume types. You can then apply tier settings when creating a volume by specifying the corresponding volume type. Available and supported Extra Specs vary per volume driver. Consult your volume driver’s documentation for a list of valid Extra Specs. Click Create, and specify the Key and Value. The key/value pair must be valid; otherwise, specifying the volume type during volume creation will result in an error. Click Create. The associated setting (key/value pair) now appears in the Extra Specs table. You can also associate a QOS Spec to the volume type. For details, refer to Section 2.2.4.2, “Associate a QOS Spec with a Volume Type”. Add a new setting to the volume type. To do this, click Create, and specify the key/value pair of the new setting you want to associate to the volume type. Edit an existing setting associated with the volume type. To do this, select the setting’s Edit action. Delete existing settings associated with the volume type. To do this, select the extra specs' check box and click Delete Extra Specs in this and the next dialog screen. By default, all volume types are visible to all tenants. You can override this during volume type creation and set it to private. To do so, you will need to set the type’s Is_Public flag to False. Private volume types are useful for restricting access to certain volume settings. Typically, these are settings that should only be usable by specific tenants; examples include new back ends or ultra-high performance configurations that are being tested. + Replace VTYPE with the name of the private volume type. This command will list both public and private volume types, and will also include the name and ID of each one. You will need the volume type’s ID to provide access to it. VTYPEID is the ID of the private volume type. TENANTID is the ID of the project/tenant you are granting access to VTYPEID. This procedure involves configuring a service outside of the director. As such, you may need to repeat it the next time you re-deploy or update the overcloud. Click Create, and specify the Key and Value. The key/value pair must be valid; otherwise, specifying a volume type associated with this QOS Spec during volume creation will fail. Click Create. The associated setting (key/value pair) now appears in the Key-Value Pairs table. At present, volume encryption is only supported on volumes backed by block devices. Encryption of network-attached volumes (such as RBD) or file-based volumes (such as NFS) is still unsupported. In the Actions column of the volume to be encrypted, select Create Encryption. Doing so will launch the Create Volume Type Encryption wizard. At present, the only supported Provider is LuksEncryptor, while the only supported Cipher is aes-xts-plain64. Once you have an encrypted volume type, you can invoke it to automatically create encrypted volumes. For more information on creating a volume type, see Section 2.2.1.2, “Create and Configure a Volume Type”. Specifically, select the encrypted volume type from the Type drop-down list in the Create Volume window (see to Section 2.3, “Basic Volume Usage and Configuration”). You can also re-configure the encryption settings of an encrypted volume type. To do so, select Update Encryption from the Actions column of the volume type. Doing so will launch the Update Volume Type Encryption wizard. In Project > Compute > Volumes, the Encrypted column in the Volumes table indicates whether the volume is encrypted. If it is, you can click Yes in that column to view the encryption settings. Log in as heat-admin to the node hosting the Block Storage service. Enable the FilterScheduler scheduler driver. The Block Storage service allows you to set consistency groups. With this, you can group multiple volumes together as a single entity. This, in turn, allows you to perform operations on multiple volumes at once, rather than individually. Specifically, this release allows you to use consistency groups to create snapshots for multiple volumes simultaneously. By extension, this will also allow you to restore or clone those volumes simultaneously. A volume may be a member of multiple consistency groups. However, you cannot delete, retype, or migrate volumes once you add them to a consistency group. The following sections discuss how to customize the Block Storage service’s volume backup settings. Unlike most tenant storage quotas (number of volumes, volume storage, snapshots, etc. ), backup quotas cannot be modified through the dashboard yet. Backup quotas can only be modified through the command-line interface; namely, through the cinder quota-update command. You can now create, view, delete, and restore volume backups through the dashboard. To perform any of these functions, go to the Project > Compute > Volumes > Volume Backups tab. Log in to the node hosting the backup service (openstack-cinder-backup) as a user with administrative privileges. NFSHOST is the IP address or hostname of the NFS server. PATH is the absolute path of the NFS share on NFSHOST. Where NFSMOUNTOPTS is a comma-separated list of NFS mount options (for example, rw,sync). For more information on supported mount options, see the man pages for nfs and mount. The backup service limits backup files sizes to a maximum backup file size. If you are backing up a volume that exceeds this size, the resulting backup will be split into multiple chunks. The default backup file size is 1.8GB. Availability zones (logical server groups), along with host aggregates, are a common method for segregating resources within OpenStack. Availability zones are defined during installation. For more information on availability zones and host aggregates, see Manage Host Aggregates. Use an existing snapshot as a volume source. If you select this option, a new Use snapshot as a source list appears; you can then choose a snapshot from the list. For more information about volume snapshots, refer to Section 2.3.8, “Create, Use, or Delete Volume Snapshots”. You can also change the volume’s type later on. For details, see Section 2.3.10, “Changing a Volume’s Type (Volume Re-typing)”. A volume cannot be deleted if it has existing snapshots. For instructions on how to delete snapshots, see Section 2.3.8, “Create, Use, or Delete Volume Snapshots”. Replace VOLUME with the ID of the target volume. If your OpenStack deployment uses a Red Hat Ceph back end, see Section 2.3.8.1, “Protected and Unprotected Snapshots in a Red Hat Ceph Back End” for more information on snapshot security and troubleshooting. Click Upload. The QEMU disk image utility uploads a new image of the chosen format using the name you provided. Migrate the volume to a different back end (Section 2.4.2.1, “Migrating Between Back Ends”). If you are migrating the volume to another back end, select On Demand from the Migration Policy drop-down list. For more information, see Section 2.4.2.1, “Migrating Between Back Ends”. A volume backup is a persistent copy of a volume’s contents. Volume backups are typically created as object stores, and are managed through the Object Storage service by default. You can, however, set up a different repository for your backups; OpenStack supports Red Hat Ceph and NFS as alternative back ends for backups. When creating a volume backup, all of the backup’s metadata is stored in the Block Storage service’s database. The cinder utility uses this metadata when restoring a volume from the backup. As such, when recovering from a catastrophic database loss, you must restore the Block Storage service’s database first before restoring any volumes from backups. This also presumes that the Block Storage service database is being restored with all the original volume backup metadata intact. If you wish to configure only a subset of volume backups to survive a catastrophic database loss, you can also export the backup’s metadata. In doing so, you can then re-import the metadata to the Block Storage database later on, and restore the volume backup as normal. For more information about volume snapshots, refer to Section 2.3.8, “Create, Use, or Delete Volume Snapshots”. You can create backups of volumes you have access to. This means that users with administrative privileges can back up any volume, regardless of owner. For more information, see Section 2.4.1.1.1, “Create a Volume Backup as an Admin”. The volume_id of the resulting backup is identical to the ID of the source volume. The volume backup creation is complete when the Status of the backup entry is available. The volume backup metadata consists of the backup_service and backup_url values. Users with administrative privileges (such as the default admin account) can back up any volume managed by OpenStack. When an admin backs up a volume owned by a non-admin user, the backup is hidden from the volume owner by default. TENANTNAME is the name of the tenant where you want to make the backup available. USERNAME and PASSWD are the username/password credentials of a user within TENANTNAME. VOLUME is the name or ID of the volume you want to back up. KEYSTONEURL is the URL endpoint of the Identity service (typically http://IP:5000/v2, where IP is the IP address of the Identity service host). When performing this operation, the resulting backup’s size will count against the quota of TENANTNAME rather than the admin’s tenant. By default, the cinder backup-create command will create a full backup of a volume. However, if the volume has existing backups, you can choose to create an incremental backup. An incremental backup captures any changes to the volume since the last backup (full or incremental). Performing numerous, regular, full back ups of a volume can become resource-intensive as the volume’s size increases over time. In this regard, incremental backups allow you to capture periodic changes to volumes while minimizing resource usage. Replace VOLUME with the ID or Display Name of the volume you want to back up. Incremental backups are fully supported on NFS and Object Storage backup repositories. You cannot delete a full backup if it already has an incremental backup. In addition, if a full backup has multiple incremental backups, you can only delete the latest one. When using Red Hat Ceph Storage as a back end for both Block Storage (cinder) volumes and backups, any attempt to perform an incremental backup will result in a full backup instead, without any warning. This is a known issue (BZ#1463058). Typically, a Block Storage database loss prevents you from restoring a volume backup. This is because the Block Storage database contains metadata required by the volume backup service (openstack-cinder-backup). This metadata consists of backup_service and backup_url values, which you can export after creating the volume backup (as shown in Section 2.4.1.1, “Create a Full Volume Backup”). If you exported and stored this metadata, then you can import it to a new Block Storage database (thereby allowing you to restore the volume backup). After the metadata is imported into the Block Storage service database, you can restore the volume as normal (see Section 2.4.1.4, “Restore a Volume from a Backup”). The Volume ID should match the ID of the volume you wish to restore. Where BACKUP_ID is the ID of the volume backup you wish to use. The Block Storage service allows you to migrate volumes between hosts or back ends. You can migrate a volume currently in-use (attached to an instance), but not volumes that have snapshots. If you wish to bypass any driver optimizations for the host migration, select the Force Host Copy checkbox. See Section 2.2.1, “Group Volume Settings with Volume Types” and Section 2.3.2, “Specify Back End for Volume Creation” for more details. Once you have a back end defined in a target volume type, you can migrate a volume to that back end through re-typing. This involves re-applying the target volume type to a volume, thereby applying the new back end settings. See Section 2.3.10, “Changing a Volume’s Type (Volume Re-typing)” for instructions. OpenStack Object Storage (openstack-swift) stores its objects (data) in containers, which are similar to directories in a file system although they cannot be nested. Containers provide an easy way for users to store any kind of unstructured data; for example, objects might include photos, text files, or images. Stored objects are not compressed. The following procedures explain how to further customize the Object Storage service to suit your needs. Erasure coding (EC) is a method of data protection in which the data is broken into fragments, expanded and encoded with redundant data pieces and stored across a set of different locations or storage media. It uses a smaller volume of storage to attain the required durability than traditional replication. When compared to replication factor of 3, savings of 50% may be attained with careful deployment. However, depending on the workload, erasure coding may incur a performance penalty. Erasure coding is supported for Object Storage service as a Storage Policy. A Storage Policy allows segmenting the cluster for various purposes through the creation of multiple object rings. Red Hat recommends you split off devices used by erasure coding and replication Storage Policies. This way behavior of the cluster is easier to analyze. Cost of adding dedicated erasure coding nodes (or just dedicated erasure coding devices). After defining the erasure coding policy, you will need to create and configure its associated object storage ring. See Section 3.1.1.2, “Configure an Object Storage Ring” for instructions. Sets whether this policy is the default one or not (yes/no). This is used if there are multiple policies defined in /etc/swift/swift.conf. This is a standard storage policy parameter. Comma-delimited list of other names that the policy is known as. Set this to erasure_coding to indicate that this is an erasure coding policy. This specifies the erasure coding scheme that is to be used. See Table 3.2, “Supported Erasure Coding Schemes” for a list of supported values. The total number of fragments that will be comprised of data. The total number of fragments that will be comprised of parity. The amount of data that will be buffered up before feeding a segment into the encoder/decoder. The default value is 1048576. When the Object Storage service encodes an object, it breaks it into fragments. It is important during configuration to know how many of those fragments are data and how many are parity. So in the Sample Erasure Coding Policy, an object will be broken into 14 different fragments, 10 of them will be made up of actual object data and 4 of them will be made of parity data (calculations depending on ec_type). With such a configuration, the system can sustain 4 disk failures before the data is lost. Other commonly used configurations are 4+2 (with 4 data fragments and 2 parity fragments) or 8+3 (with 8 data fragments and 3 parity fragments). Once you have deployed a policy and have created objects with that policy, these configurations options cannot be changed. In case a change in the configuration is desired, you must create a new policy and migrate the data to a new container. However, once defined, policy indices cannot be discarded. If policies are to be retired, they may be retired, but not be removed. There is essentially no performance penalty for having old policies around, but a minor administrative overhead. Object Storage uses a data structure called the Ring to distribute a partition space across the cluster. This partition space is core to the data durability engine in Object Storage service. It allows the Object Storage service to quickly and easily synchronize each partition across the cluster. When any component in Swift needs to interact with data, a quick lookup is done locally in the Ring to determine the possible partitions for each object. The Object Storage service already has three rings to store different types of data. There is one for account information, another for containers (so that it’s convenient to organize objects under an account) and another for the object replicas. To support erasure codes, there will be an additional ring that is created to store erasure code objects. Where 3 is the number of replicas. Where 14 is for a 10+4 configuration with 10 data fragments and 4 parity fragments. Consider the performance impacts when deciding which devices to use in the erasure coding policy’s object ring. We recommend that you run some performance benchmarking in a test environment for the configuration before deployment. After you have configured your erasure coding policy in the /etc/swift/swift.conf and created your object ring, your application is ready to start using erasure coding by creating a container with the specified policy name and interacting as usual. After defining a new Erasure Coding policy and configuring its object storage ring, you can use it when creating a new container for the first time. If you have multiple policies defined, each container will be created with the default storage policy assigned. By default, the Object Storage service will copy an object whole whenever any part of its metadata changes. You can prevent this using the fast-post feature. This is useful if you want to save time in changing the content types of multiple large objects. Log in to the nodes hosting the Object Storage proxy service. On a typical overcloud deployment, the Object Storage service is installed on the Controller nodes. The OpenStack Image service, by default, saves images and instance snapshots to the local filesystem in /var/lib/glance/images/. Alternatively, you can configure the Image service to save images and snapshots to the Object Storage service (when available). Log into the node running the Image service (the controller node also running Identity) as root and source your OpenStack credentials (this is typically a file named openrc). Verify that the Image service is part of the tenant services with role admin. One of the roles returned should be admin. In the same file, add the following lines to the DEFAULT OPTIONS section. ADMINPW is the value of admin password attribute in the /etc/glance/glance-api.conf file. From this point onwards, images uploaded to the Image service (whether through the Dashboard or glance) should now be saved to an Object Storage container named glance. This container exists in the service account. Even with encryption, it is important to use a different method to dispose of the root disk of the proxy, as access to both this and the storage node disks may allow an attacker to decrypt the data. The following changes need to be made on the overcloud. Changing the encryption key and then attempting to download previously uploaded files will cause an error and may result in data loss. POLICY is the name or alias of the policy you want the container to use. See Section 3.1.1.1, “Configure an Erasure Coding Policy” for a sample policy that uses erasure coding. Browse for the container in the Containers section, and ensure all objects have been deleted (see Section 3.2.6, “Delete an Object”). The OpenStack Shared File Systems service (openstack-manila) provides the means to easily provision shared file systems that can be consumed by multiple instances. In the past, OpenStack users needed to manually deploy shared file systems before mounting them on instances. The OpenStack Shared File Systems service, on the other hand, allows users to easily provision shares from a pre-configured storage pool, ready to be mounted securely. This pool, in turn, can be independently managed and scaled to meet demand. 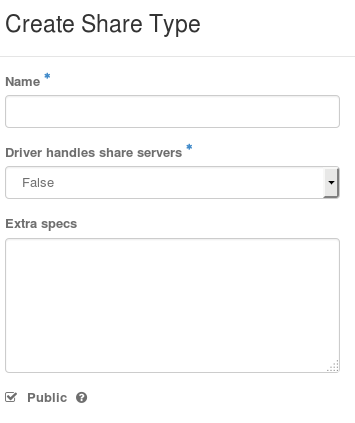 DHSS (or driver handles share servers) specifies whether the share type will use drivers that handle share servers. This should match the value of driver_handles_share_servers in your back end definition (true or false). The --is_public false option indicates that the share type should not be accessible to the public. If you want the share type to be public, remove this option. As an OpenStack admin, you can prevent users from creating public share types through the dashboard. See Section 4.9, “Disable Creation of Public Shares and Share Types Through the Dashboard” for related information. With this release, the Shared File System Service only supports NetApp storage controllers as back ends. See Creating and Defining Manila Share Types for information on extra specs supported by NetApp. GB is the size of the share, in GB. This information will be used later when mounting the share (Section 4.7, “Mount a Share on an Instance”). SHAREID is the ID of the share created in Section 4.3, “Create a Share”. IDENT is the method that the Shared File System service should use to authenticate a share user or instance. cert: this method is used for authenticating an instance through TLS certificates. user: use this to authenticate by user or group name. ip: use this to authenticate an instance through its IP address. Note that access to the share has its own ID (ACCESSID), b4e990d7-e9d1-4801-bcbe-a860fc1401d1. At this point, the instance will no longer be able to use the mounted share. See Section 4.4, “List Shares and Export Information” to learn how to view a share’s export information. The 'enable_public_shares':False setting disables the Make visible for all checkbox. Likewise, 'enable_public_share_type_creation':False disables the Public checkbox in the share type creation interface. To view your changes, reload your dashboard. The checkboxes should no longer appear in their respective interfaces. Disabling these checkboxes does not prevent users or OpenStack admins from setting shares or share types to public after creating them.